There is certainly no shortage of things to do when in Vegas, from the array of shows and stars and acts that are performing up and down the strip in some 20+ casinos with the highest budgets on earth, to the attractions and beautiful sights of just walking through any of the buildings, boredom is not something that will find you. Casinos always want to try and one up each other and always want to have something different or better. Take Treasure Island for example…. Having themed rooms or rides inside the hotels and Casinos is not a foreign thing, Circus Circus has a small rollercoaster on the first floor of their facility. But the coolest things are not always found in the prominent casinos like you would think. The first that usually get named are the MGM Grand and the Bellagio, probably because they are mentioned in movies the most. But then you find a gem like the Luxor, that has elevators that move diagonally…. or in this case Treasure Island that has an Agents of Shield training program and an Avengers show room. Here’s a short video featuring Stan Lee himself explaining a little about the state of the art one of a kind exhibit! Vegas is obviously known for a handfull of things which usually include gambling and prostitution. It can safely be assumed that the night club scene in a city with that much money flowing through it is second to none, and I would say you’d be correct. Some other cities may have a nightclub here or there that may top one of our favorites, but no other city has as many list toppers as Vegas does. We will touch on some of the cooler clubs that are in existence, the ones you may or may not have heard about as well as hit a few other high spots of the unique Las Vegas night life. 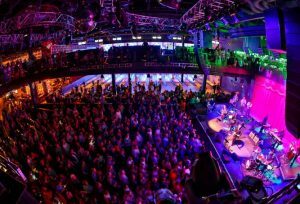 The Brooklyn Bowl is by no means the hottest night club in Vegas, but certainly may be the most unique and in some ways the most appealing. With a massive dance floor and a large stage (something other clubs don’t have as much room for) the Bowl, for short, is a huge draw for live bands and their fans. What tops all of this off is the smooth industrial feel that the room has, and oh yeah, did I mention you could be bowling if you wanted to? With exceptional architecture and an old world meets new worlds kinda feel there are a dozen bowling lanes just off the dance floor. 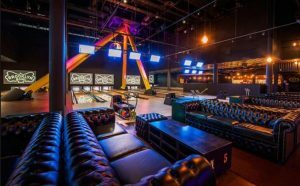 The Brooklyn Bowl because of its openness and its versatility I think is a great option for small groups that are hanging out together. It is also one of the only top club spots that is not in or part of a casino, which may be a pro or a con for you. Have fun and remember, drink and bowl responsibly! We all know the old saying…. But is the Vegas Nightlife really all it seems to be? A sea of debauchery and scenes so obscene that our family can’t know about it? That’s what we will look at with this blog. An inside glimpse into the real Vegas nightlife! Strap in, or on, and enjoy the ride of the unspoken.